Sasho Iliev is 15 years old and he is a pupil in the 9th grade in the school for children with impaired vision “Prof. Ivan Shishmanov” in Varna, Bulgaria. 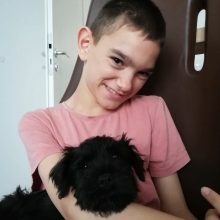 At the age of 6, he started using an eye-tracking system acquired with the help of foundation “Karine’s Dom”, thanks to a donation from a large company. And so he became the first user of such a system in Bulgaria. With the help of his school teacher Ms Yana Raeva, he started learning how to read and write. At first, the progress was slow, but his strong motivation to communicate leads to less and less written mistakes. At the moment he is using the eye-tracking system at school during the classes in mathematics and Bulgarian. After having acquired a new modern eye-tracking system, Sasho started surfing the Internet. He also plays computer games such as TMNT Legend (25th level), Strike Force (43rd level) and other games which he sometimes plays with his sister or his brother. One of his favourite activities is to communicate and have fun with his family.